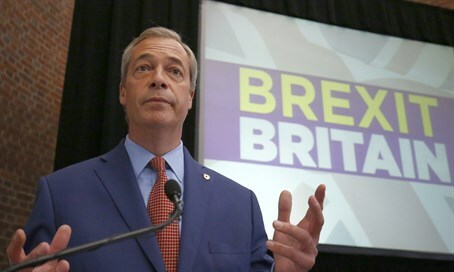 Joining the growing fallout from the Brexit vote, in which Britain voted to leave the European Union, Nigel Farage has announced that he will step down as head of the UK Independence Party. Farage has campaigned strongly for years for the UK to leave the EU. Last week, after the Brexit vote, Farage was ridiculed in the European Parliament as he flaunted his victory. Although several members of the UKIP party have been banned for their racist beliefs, Farage and UKIP have been strong supporters of Israel and even have a group called "UKIP friends of Israel." However, UKIP also supported a ban on shechita, though claiming that they were not opposed to Jewish slaughter but to Muslim Halal. Ironically, Farage himself is a member of the European Parliament. He has described his party's campaign for Britain to leave the EU as "the turkeys that voted for Christmas." This is the third time that Farage has stepped down as leader of his party. But this time, he insists it is for good. He has described the chances of returning as head of UKIP as "somewhere between nil and zero."